Dizzy the white dwarf star is under a powerful curse, doomed to spin faster than any of its peers. No one knows why poor Dizzy was handed such a fate, but its wild gyrations mean that the star could be headed for a violent death, perhaps unlike any stellar explosion we've seen before. White dwarfs are the dense cores left over when stars like the sun die. Dizzy, officially catalogued as RX J0648.0-4418, is probably the densest known white dwarf, packing more than the mass of our sun into a ball about the size of Mars. The star takes only 13.2 seconds to spin once on its axis. The next fastest white dwarf, AE Aquarii, takes 33 seconds per revolution. If Earth were somehow set spinning as fast as Dizzy, people would rapidly be flung out into space, followed closely by the oceans, mountains and crust. The deep rocky mantle and almost all of Earth's core would also be torn apart by this super-spin. "Even if this were a normal white dwarf of half a solar mass, it would be close to or beyond the limit of break-up," says Sandro Mereghetti of the Institute of Astrophysics and Cosmic Physics in Milan, Italy. Luckily for Dizzy, being extra-dense means that its surface gravity is well over a million times as strong as Earth's, so it can hold itself together. It is possible Dizzy was born this way, the core of a fast-spinning ordinary star that spun even faster as it contracted. But Mereghetti suspects otherwise. He thinks Dizzy got a push from its orbital partner, a hot star called HD 49798. A few hundred thousand years ago, an ageing HD 49798 began to expand into a red giant, but then its outer layers were siphoned off by the white dwarf, he argues. Spiralling down to hit Dizzy at an oblique angle, that material would have made the dwarf spin super-fast. One day HD 49798 will again swell in size as it runs out of nuclear fuel. Then Dizzy will take up even more material. A few million years on, it will reach a critical mass that should signal its demise. What happens next depends on chemistry. If Dizzy has an oxygen-carbon mix, like most white dwarfs, an explosive thermonuclear reaction could rip through its body, generating a type Ia supernova. Because of Dizzy's spin, the critical mass for this could be higher than normal, so the resulting supernova would be ultra-bright. Dizzy is close enough to us that we might see it shining as bright as the full moon. But Dizzy might be a blend of oxygen and neon. In that case, the dwarf could collapse and leave behind what is called a millisecond pulsar – a rapidly spinning neutron star. This type of stellar explosion has never been seen before, although it would be a much less spectacular event. For now it is impossible to measure the dwarf's composition and figure out Dizzy's ultimate fate, says Mereghetti. The only way to know for sure will be to watch and wait. This is very interesting. It has been argued before that type Ia supernovae may originate from white dwarfs that have been spun up by a companion. The fast spin and the centrifugal force mean that the inward pressure on the core of the star is alleviated, allowing the star to grow past the Chandrasekhar limit of 1.4 solar masses. But when the white dwarf can no longer feed off its companion it will gradually slow down, until the centrifugal force lessens so that the core can't bear the weight of its own mass anymore, and so it explodes. 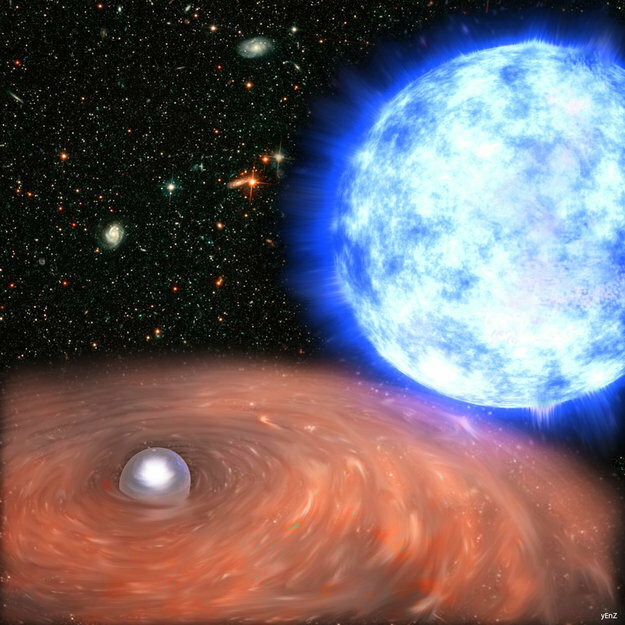 The white dwarf called Dizzy is a special case, of course, since it is the fastest-spinning white dwarf known, and because it may not only have been spun up once by a companion, but it may become spun up by the same companion again, when the companion reaches the next stage in its evolution. I'm totally fascinated by the companion, HD 49798. The only color that the caption mentions in relation to HD 49798 is red, but this star is blue, blue, blue! Its color index is -0.27. Its V-I index, too, is -0.27. That's hot! That's BLUE!!! My software quotes the MHD catalog, which says that HD 49798 is a "very hot subdwarf". It is indeed. HD 49798 is not a puny star, because the Hipparcos catalog says that its luminosity is probably around 300 times the luminosity of the Sun. That's not bad, but it is admittedly a bit faint for a star of spectral class O6. It makes sense that HD 49798 got so blue by losing some of its outer atmosphere to its white dwarf companion, getting both bluer and a bit fainter in the process. What a fascinating star HD 49798 is, and what a fascinating white dwarf companion it has got!